The town of Valldemossa is only around 15-20 minutes’ drive from Palma de Mallorca into the Tramuntana mountains, but feels a world away from the capital. Perched on a hilltop, surrounded by terraced terrain, Valldemossa was named after the area’s original Moorish landowner, Muza. With its car-free cobbled alleys and rich cultural heritage, the town is a treat to visit. 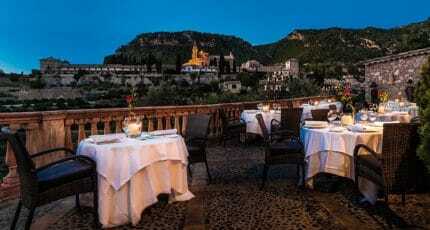 Here we provide all the information you want to know to enjoy Mallorca’s most elegant of villages. 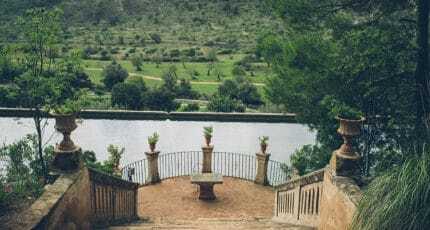 The highest town in Mallorca is probably best-known as the place where the Polish composer Frédéric Chopin and his lover, the French writer George Sand, spent the winter of 1838/9, staying in rented rooms in the monastery. And, as a result, it’s probably Mallorca’s most visited town. In fact, Chopin and Sand didn’t have the best of stays and Sand’s book about their experiences didn’t pull any punches. Nevertheless, the book ‘A Winter in Majorca’ is a bestseller and is on sale in almost every shop in Valldemossa, in a variety of languages. Valldemossa is also home to Costa Nord – a contemporary cultural centre, established by Hollywood actor Michael Douglas, whose home S’Estaca is off the Valldemossa to Sóller coast road, near Deià. For the Mallorcans, Valldemossa has a more important claim to fame: it was the birthplace of the island’s only saint: Santa Catalina Thomas. Leave the busier part of the town, and head for the church of Sant Bartomeu; in the peaceful C/Rectoría behind it, you can visit her tiny birthplace and shrine. You can visit Valldemossa’s Real Cartuja (Royal Carthusian Monastery), including the church, cloisters, and old pharmacy. Part of the monastery is King Sancho’s palace – later gifted to Carthusian monks, who converted it and other buildings into the monastery. It probably has more visitors than any other building in Mallorca, apart from Palma’s cathedral, La Seu. A ticket for the Real Cartuja includes a short Chopin piano recital. Cell number four of the monastery is home to the Chopin museum, the exact spot George Sand and the famous composer stayed during the winter from 1838 to 1839, and containing his original piano and other artefacts. Learn all about the history of Valldemossa, including the Archduke Lluis Salvador’s adventures here, at cultural centre Costa Nord. In addition to a short documentary narrated by founder Michael Douglas himself and compelling visual effects, visitors have the chance to taste local Mallorcan products and watch traditional Mallorcan dance displays. A great deal of walkers choose to make Valldemossa their base for hiking excursions in the rich and varied Tramuntana mountain range. Situated high above Valldemossa, Puig des Teix is one of the most visited peaks in the Tramuntana mountain range. Experienced hikers start at City bus stop in Valldemossa, and trek some 16km up through the Son Marroig estate, once the beloved home of Austrian Archduke Lluis Salvador, to the 1064m summit, where they’re met by jaw-dropping mountain vistas. This challenging route takes around four-and-a-half hours, and brings you right back to the bus stop. Full details may be obtained from the tourist information office in the village. For something less strenuous, simply stroll Valldemossa’s enigmatic cobbled streets. Lined with shops, boutiques, and plenty of places to eat and drink, pretty much every tourist’s shopping needs can be met somewhere in the town. Cocas de Potatas, Valldemossa’s famous biscuits, are found in every bakery. Valldemossa’s street market takes place every Sunday morning. Full of colour, it is a great place to source quality local produce, including fruit and vegetables, cheeses and Spanish ham. You could also try going direct to the producer. The agricultural estate of Son Moragues, on the outskirts of the town, dates back 700 years. Olive oil production is still going strong here, playing a vital part in the ecological preservation of the Serra. Its organic jams – available to buy in the estate shop – are delicious, and its olive oil is the only 100% Mallorquin variety in the world. 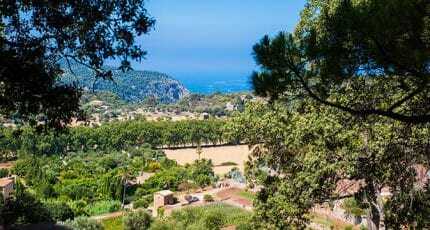 Valldemossa is just a little over a mile from the coast as the crow flies, and there are a couple of options for quiet, secluded beach visits a short distance from town. Instead of turning right towards Deià from the village, follow the sign towards Andratx. One kilometre down the road you’ll see a small sign for Port de Valldemossa. The narrow, twisting road continues for 6km until you reach the harbour area with its pebble beach, Cala Sa Marina, and cosy, unassuming restaurant. Caló de s’Estaca is a small cove popular with walkers and locals. Located approximately 4km from Valldemossa, the treacherous road from the port is not recommended for driving, and there is very little space to park. Visitors usually opt to hike, lending the cove an unspoilt, private atmosphere. The hike to Caló de s’Estaca starts at the Miramar monastery, and presents some technical difficulty. Walkers are rewarded by the cool shade provided by holm oaks along the route, and a refreshing dip in beautifully clear turquoise waters at the cove. In line with its romantic atmosphere and quality sense of heritage, Valldemossa offers many opportunities for dining experiences ranging from the refined and romantic, to the real and rustic. Es Roquissar is the perfect place for a long leisurely lunch enjoying the pleasant buzz of the main square in which it sits. The reasonably priced menu is fresh and inventive. Tucked away down a narrow winding alley, QuitaPenas Valldemossa is a much-loved tapas bar. Small and authentic, there are only three tables inside, but guests happily cram onto cushions on the steps outside while they savour fresh and delicious local delicacies. For fusion cuisine in a uniquely special setting, head to Casa de Sa Miranda. Housed in the stone building that was once the original entrance to the Real Cartuja monastery, the food is elegant, and the feel unpretentious. Drive to Valldemossa’s port, and you’ll soon spot the only eaterie. A no-nonsense Mallorcan restaurant with a no-nonsense name, Es Port serves traditional food in a cosy and unassuming setting. Grand Café Cappuccino lends its hallmark touch of sophistication to the village square, serving up simple European-style dishes, exquisite coffee and fabulous cocktails. Open to non residents, the restaurant at Hotel Valldemossa is a fine choice if you’re looking for something particularly special. A beautiful restaurant with beautiful food, fit for Spanish royalty (whom it has indeed played host to). High on a hilltop, a short stroll from the centre, romantic Hotel Valldemossa is the stuff of stylish dreams. It’s not cheap, but service is impeccable, the interiors sumptuous, and the hotel retains a magical ambience at night. A traditional Mallorcan stone house with a beautiful sun terrace, Es Petit Hotel de Valldemossa has a homely feel, largely conjured by the warm and friendly husband and wife team who run it. Guests unwind in the cosy lounge and well-stocked library. 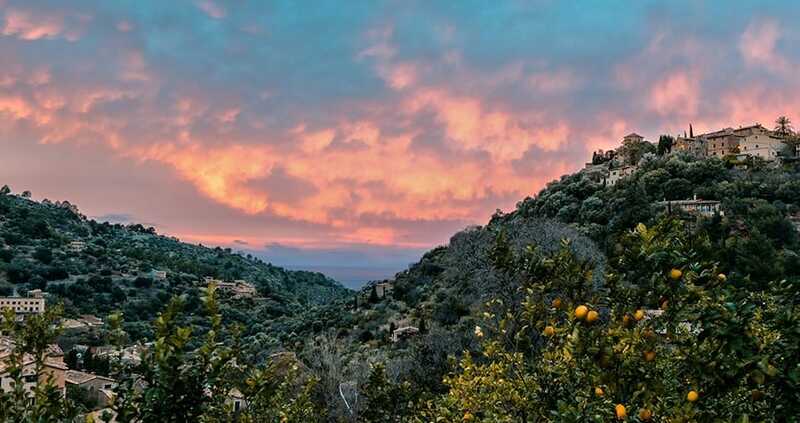 Just across the valley, the handsome yellow stone Mirabó de Valldemossa is a four-star, family run boutique hotel housed in an old olive press, with enchanting views over equally photogenic Valldemossa. For a chance to hear a variety of international musicians playing music from the composer who helped bring fame to the town, visit in August, when Valldemossa hosts the annual Chopin Festival. 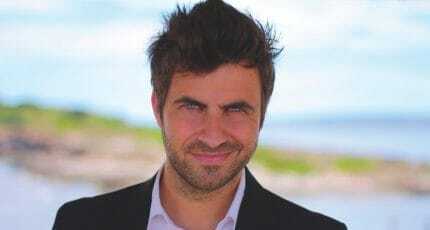 Pianist David Gómez and his yearly candlelit summer concerts are not to be missed. See him lighting up the monastery gardens in Valldemossa to spectacular auditory and visual effect. Living in Valldemossa is seen as a privilege, and residents have a keen sense of respect for their town. The handful of artists choosing to make Valldemossa their base extoll the peace, tranquility and beauty it offers, all within easy reach of Palma and the airport. Indeed, many residents commute to Palma on a daily basis, returning to the relative quiet of their hillside haven. 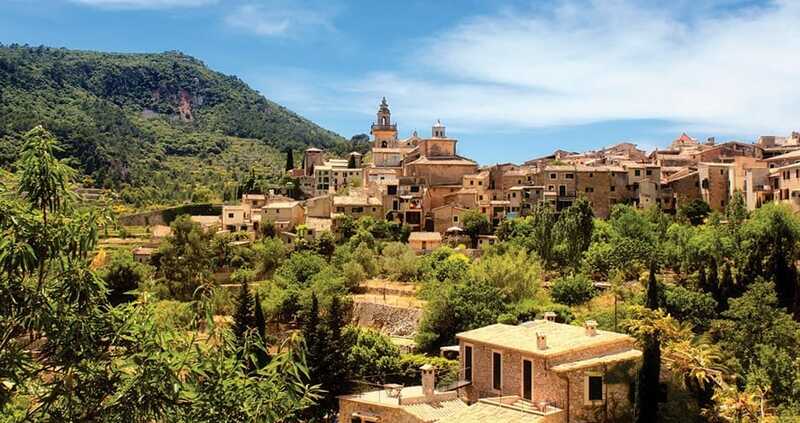 The small-town quality of life is hard to beat, and while Valldemossa certainly gets its fair share of tourists, the pervading sense is of calm and relaxation. Valldemossa’s fine architecture and environment attracts wealthy buyers searching for prestige properties, and the small selection of homes available for sale do not disappoint. Historical mansions are picked up by owners of a high calibre, which in the past have included members of the Swarovski family. Set in a 247 acre estate, S’Estaca, the Moorish castle belonging to Michael Douglas is, at the time of writing, on the market for a cool $62m. As one of the most sought-after areas on the island, prices are high in Valldemossa, and the choice fairly limited. Located on the outskirts of town, the George Sand Urbanization, an exclusive development of contemporary architect-designed homes, may offer more choice. Situated in Sóller, Casas Mallorca is a real estate agency specialising in a diverse range of properties in the northwest of Mallorca, including apartments, town houses and country homes. 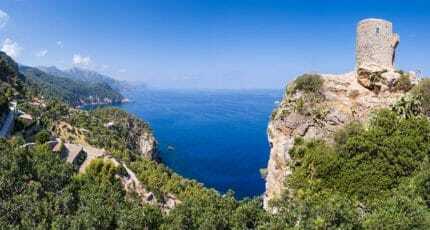 The rocky coastline west of Valldemossa towards Andratx beckons discovery of quintessentially Mediterranean beach coves promising peace and relaxation far from the crowds. Cala Banyalbufar, Port D’Es Canonge beach and Sa Bunyola beach all lie within 14 to 17 km of Valldemossa, adjacent to the seaside village of Banyalbufar. What these small inlets lack in fine sand and facilities, they make up for in perfect crystalline clear water, and gorgeous scenery. Further afield, 25 km along the coast from Port de Valldemossa is Playa Cala d’Estellencs, a small fishing harbour at the foot of vertical and steep rocks. When enough rain has fallen, the cliffs generate a scenic waterfall, Torrent de Son Fortuny, to be enjoyed by swimmers. Visitors can access the beach by car, along a steep road from the village of Estellencs. Follow in the footsteps of Austrian nobleman Archduke Lluis Salvador, and pay a visit to the Sa Foradada peninsula and the Miramar monastery, accessed roughly halfway off the road from Valldemossa to Deià. Finding a haven of natural beauty far from court life on Mallorca’s south west coast, the archduke fell deeply in love with the area between Valldemossa and Deià, creating numerous paths and lookout areas, restoring the palace of Son Marroig, and playing an important part in the conservation of the land. 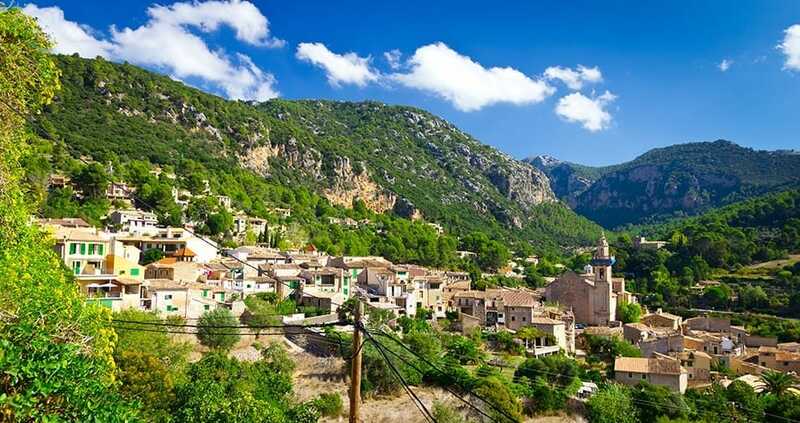 Nestled higher up in the mountains is the much-treasured village of Deià. A paradise for visiting creative types, hikers, discerning holidaymakers, and the odd famous actor, model, and musician, Deià has to be one of the island’s prettiest and most superbly placed locations. Go there to relax over a meal or drink amidst some wonderfully soul-affirming views. Next stop after Deià are the delights of Sóller and Port de Sóller. Set in a fertile valley of orange groves, vibrant Sóller town offers a pleasing combination of authenticity and cultural and artistic spots of interest, while the port, with its beautiful horseshoe-shaped bay, is one of the most scenic holiday locations in all of Mallorca. Fifteen minutes in the other direction from Valldemossa, in the foothills of the mountain range, lies the Raixa estate. Previously an Arab farm with a beautiful manor house, guests are invited to stroll through wonderfully fragrant gardens and explore the mansion interiors. 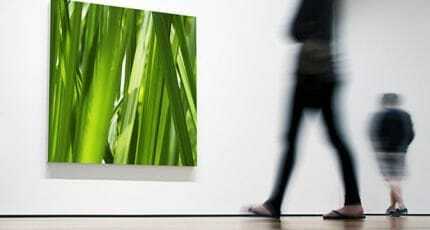 A newly-conceptualised visitor centre, opened in 2012, offers visitors a unique insight into life in the UNESCO-protected Serra de Tramuntana. 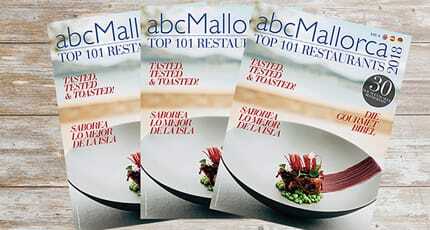 We hope this abc-mallorca guide to Valldemosaa has been useful. Check out our other guides which reveal all that Mallorca has to offer for those in search of a luxury lifestyle. 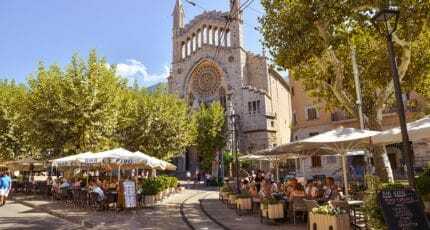 We hope you have found this article about the Valldemossa useful and that you have many memorable stays in Mallorca as a result of our recommendations.